Arena’s Check-In system is a detailed mechanism to ensure that the correct people end up in the correct classes using stand-alone computers with barcode readers and label printers. Ideally, you can use these stations without supervision to allow a quick and efficient check-in process for individuals and families. You can tie Check-In to a Small Group, Group Level, or Tag, or use as its own Attendance Type Category for manual check in. If you are using Arena Check-In and would like to allow non-family members to Check-In one another, your Administrator can create a Relationship Type containing the phrase "can checkin" (case insensitive, no quotes) that permits this action. When you self-host Arena, you can use the option to print from server that is connected to your printers. With a remotely hosted server, the print job must pass through a local windows program (CheckIn Run Once App) that can provide a user name and password to the printer. Apple, Android and IOS devices cannot run Windows applications and therefore cannot pass the print job. When using an iPad you are running CheckIn via a browser not the CheckIn windows application. Self-hosted customers can choose to print from a CheckIn workstation or from a network printer on the local arena network (LAN). The print from server option is required when using a non-Windows computer i.e. : iPad, Android tablet or MAC. Remote hosted customers must select print from the CheckIn workstation. With a remotely hosted server, the print job must pass through a local windows program (CheckIn Run Once App) that can provide a user name and password to the printer. Apple, Android and IOS devices cannot run Windows applications and therefore cannot pass the print job. When using an iPad or other non-windows operating system you are running CheckIn via a browser, not the CheckIn windows application. Once you evaluate check-in needs for your organization, follow the below steps to set up Check-In. Each step is explained below. •Create Attendance Type Categories. 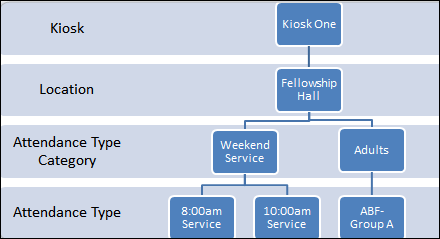 How you organize Attendance Type Categories and Attendance Types impact attendance reporting. •Create Attendance Types that represent the classes, events and meetings. The name of the Attendance Type displays on the Check-In screen. Every Attendance Type that uses an age range or birthdate requires everyone using the Attendance Type to have a complete birthdate MMDDYYYY on their record. If using grade, the person needs to have grade on their record. •Create frequencies. There must be a Frequency setup for the Attendance Type in order for Arena to create Occurrences. The Occurrence allows a person to check in to the Attendance Type. You can set frequencies for an Attendance Type or at the Attendance Type Category level and mark applicable Attendance Types. The Check In start and end times dictate when the class is available while the Class Start and Class End time create the times for the Occurrence itself. •Set labels. You can set labels for an individual Attendance Type or at the Attendance Type Category level and select applicable Attendance Types. •Add kiosks/computers, set kiosk schedules, and printers. There must be at least one Kiosk and kiosk schedule. Arena reads the schedules for each kiosk to determine what to display. You can add each kiosk manually or by launching the Check-In Application on the kiosk, which is the recommended method. Doing so generates a schedule for every day, from 12:01AM to 11:59PM, which you can customize. You can then assign Locations for the kiosk. •If your organization is using barcode scanners, verify applicable drivers are installed. Shelby supported scanners are listed here.